On a sunny Thursday morning in early May, twelve students from local high schools of the Confederated Salish and Kootenai Tribes of the Flathead Reservation in western Montana gathered in the fitness center cafeteria at Salish Kootenai College (SKC) for an event called “Youth Day.” The students were welcomed to the event by SKC president Dr. Sandra Boham. 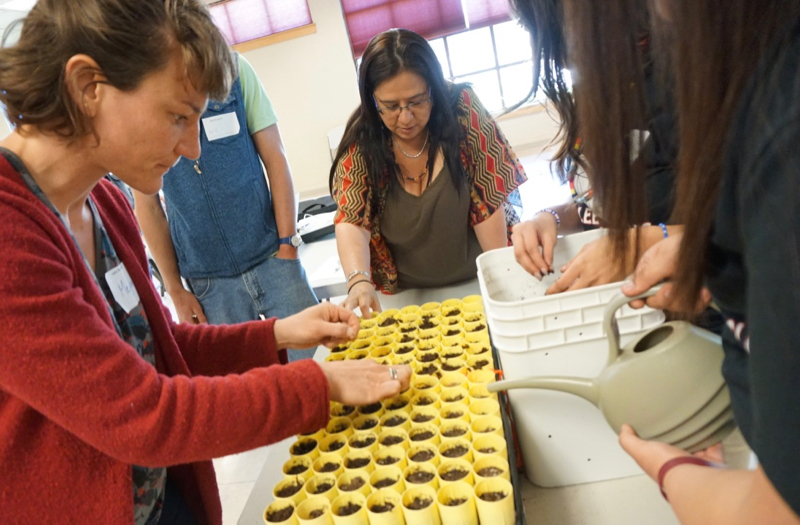 Youth Day, a one-day event organized by researchers and educators from the Native Waters on Arid Lands (NWAL) project team, aimed to provide opportunities for meaningful dialogue and learning around the themes of climate change, adaptation, water and agriculture. The event agenda included an interactive “climate myths versus facts” session with NWAL education lead Meghan Collins; an outdoor dendrochronology lecture and tree-coring demo by Dr. Rick Everett, Professor of Forestry at SKC; a hands-on planting activity in a native plant restoration site on campus with SKC Extension Director Virgil Dupuis, and more. 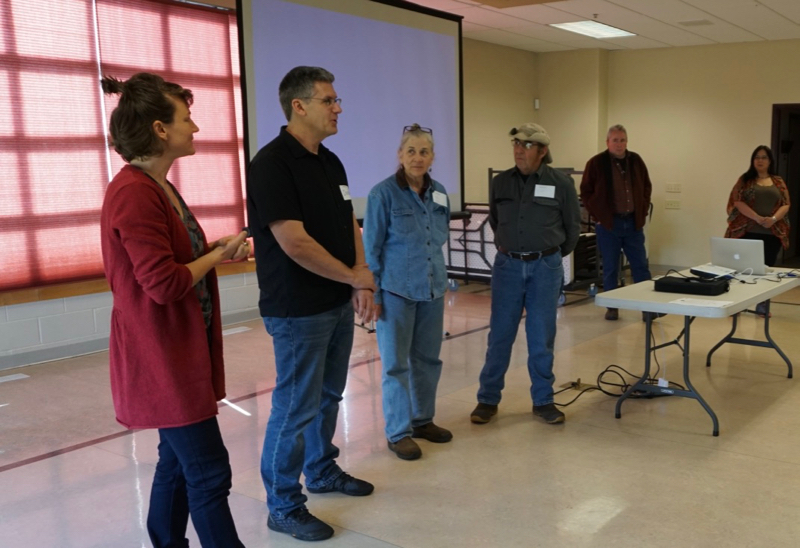 NWAL team members Meghan Collins, Derek Kauneckis, Anna Eichner, Scott Goode, Virgil Dupuis (SKC) and Mary Rose Morigeu (Confederated Salish and Kootenai Tribes) welcome participants to Youth Day, May 3, 2018. The idea for this event was sparked via feedback from participants at NWAL’s Tribal Summit. The Tribal Summit is an annual event that gathers members from tribes across the western U.S. for two days of talks, workshops and two-way dialogue about issues on reservations and tribal lands related to climate change, agriculture, ranching, water resources, economics, and other topics of interest. “Feedback from the Tribal Summit said, over and over again, that we cannot be talking about issues of climate without engaging our youth,” Collins said. As such, Youth Day was designed not only as an opportunity for the NWAL team to teach the students, but to learn from them as well. In the early afternoon, a group of five students from the Arlee EAGLES club – a student-run environmental advocacy club from Arlee High School located on the Flathead Reservation – stood before the group, teaching event attendees how to plant seeds of native Chokecherry and Twinberry in long, yellow, tube-shaped pots. Meghan Collins (NWAL Education Lead) and Mary Rose Morigeau (Confederated Salish and Kootenai Tribes) learn native seed planting techniques from students from the Arlee EAGLES Club at NWAL Youth Day, Salish Kootenai College. May 3, 2018. A shallow hole for the seed, a sprinkle of peat moss on top, and a little water, the Arlee students explained, as youth from other nearby schools of the Flathead Reservation, other tribal members, and members of the NWAL team circled around to try for themselves. The Arlee students also presented an array of environmental projects that they had undertaken at their school, including a school-wide recycling program, a greenhouse, and an impressive effort to monitor emissions generated by their school’s coal-powered heating system. The students hope to use the emissions data to convince their local school board to change energy generation at their school to a cleaner and more sustainable system. Youth Day concluded with a discussion and presentation by NWAL team member Scott Goode on a new approach for in-ground composting and sustainable gardening that also helps sequester carbon from the atmosphere, and a visit to the SKC vegetable garden plot. Youth Day at SKC was the second ‘Youth Day’ event hosted by the NWAL project; the first was held at the Desert Research Institute in Reno, Nev. in November 2017. Both events provided valuable opportunities for sharing knowledge and ideas across generations. Additional NWAL Youth Day events are planned with Native students from Paiute and Shoshone Tribes in Nevada and Navajo Nation, Hopi and other Pueblo communities in Arizona and New Mexico.